It’s not often I treat myself to a make up haul, for so long now the only contents of my makeup bag have been a Lancome mascara and lipgloss. Foundation is a product I never tend to wear as I tend to rock the suntan I can for as long as possible. Our Summer this year was pretty non existent and to ensure my face has a healthy glow, preparing for the Winter months ahead with foundation is the only way forward! The ladies at the Benefit makeup counter in my local Debenhams were super lovely and explained all the different coverage products in the range and helped me choose the best for my skin and what overall look I wanted. I came out with Benefit Hello Flawless Oxygen Wow Foundation which gives great coverage with a flawless glow. A liquid foundation that is easy to apply and blend in with a makeup brush. The Hoola Bronzer offers a gorgeous matte glow to use on top of your foundation. You can add contour to your face by using the included slanted powder brush to glide over your cheekbones, jawline and the centre of your nose. I use a larger bronzer brush as opposed to the slanted powder brush. Cover blemishes before applying foundation with the Boi-ing Airbrush Concealer or use after applying foundation and bronzer to brighten eyes if gently applied around the eye area with a foam sponge. I am not an expert when applying liquid eyeliner, so it was nice to realise the Hoola Bronzer is a multi use beauty product as by using a shading eye brush, a thin line of Hoola can be added under the eye before applying mascara. Finally, possibly the most awesome beauty product ever and one which I wish I had known about much sooner… Benefit Gimme Brow is a mini volumizing eyebrow gel for helping to give the appearance of thicker eyebrows. It simply tints brows with the use of a mini mascara brush and as it is water resistant you are reassured by the fact it will stay in place! It would have been great to add Benefit makeup brushes to my haul, but it made sense to go and have a splurge in Primark as their range of beauty items is quite comprehensive and somewhat cheaper! 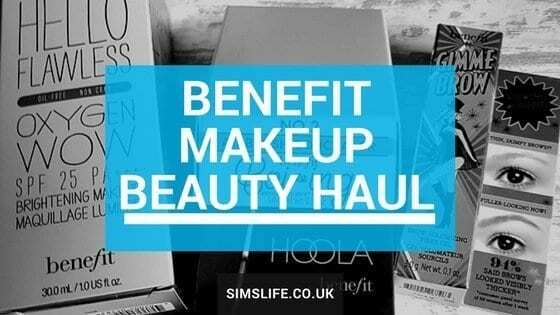 The Benefit range is super easy to apply and even when you are on the minutes, especially for the school run. I just need to treat myself to a larger makeup bag now that holds more than just mascara and lipgloss. My daughter keeps trying to get me to use make up sponges but I prefer the brushes lol. The Primark ones are great. I love Benefit, I love their brow products! Thanks for joining us at #TriumphantTales this week!